A reader shares a photo of an Amish-owned business in the Shipshewana area of northern Indiana. Is paintball popular among young people in this community? I’ve heard of paintball guns being used by Amish youth before, notably in a tragic incident involving Amish teen pranksters in Ohio. This isn’t the only sports facility owned by an Amish person. The 850 Center is another notable one in this same community. It’s been described as an “Amish YMCA”. Apparently there are replicas of it in other settlements. Sports are a subject where you’ll find mixed opinion among Amish. For some, sports and games are worldly and primarily for children. Others see sports as favorable to “alternative” youth activities. Idle hands, as they say. I tried paintball in my younger days, a couple of times. I found it sweaty, uncomfortable, and not nearly as fun as a young man might wish it to be. Those paint pellets are as hard as rocks when they hit you. Maybe it’s just a relatively benign way of working out adolescent aggression. For the Amish however, paintball does seem a step beyond softball or basketball. I could see an Amish parent supporting youth sports, but not being as thrilled with this one. 22 responses to Amish paintball? Seems atypical to me – rather “wordly” compared to what I’m used to. And strange in that some are beginning to find pelleting others with something acceptable. I’ve never participated in paintball, but have seen some injuries caused by it. I think that’s the first Amish business sign that doesn’t specify closing at 5 pm (in time to get home for supper). I just noticed the rather late hours Lattice after you pointed it out. I think 1 or 2 pm is about when the first RV factory shift lets out in this community. I’ve never played paintball, but my family was once at a mountain resort where it was available as an activity. The equipment for rent was on display in the resort office, and looked so much like real military equipment. My dad, who is a gunsmith by trade, was disgusted that something so realistic would be available as a game. It’s not different than some of the video games. I think this is all covered in the Constitution. TJ looks like we had the thought about video games at the same time. Is it in their makeup that boys tend to gravitate towards more violent games? I think that is a safe generalization to make that they do, I have just wondered if it is more learned, or inherent. I recently read a piece in Family Life where the writer was dismayed at young boys playing “shoot-em” by mimicking a gun with the finger. From an Amish standpoint, drawbacks of this game are not only the element of faux violence using weapons, but it’s also rather expensive. To TJ, I would never want a game to be illegal just because I dislike the aesthetic it represents. I care too much about my own constitutional rights. I’m so very grateful for the attitude towards gun safety that my dad instilled in me. I think it’s necessary if you live around guns. The rule for us was that you never, ever pointed a gun at anything that remotely resembled a person, no targets with human silhouettes, no scarecrows, no violent video games, absolutely nothing. We have the same expectations for our son, who is five. He draws pictures of guns and uses sticks for guns all day long, but he can only pretend to hunt bears and such. If he were to so much as point a finger at a person, he would be seriously disciplined. There are plenty of contact/team/field sports for boys to release their natural aggression. There is no room in our life for games that imitate war. On the positive side at least it is physical activity, rather than playing a video game where you sit around doing much more realistic virtual violence. I think there is a phase in particular that males go through where paintball might be quite appealing, for English kids and some Amish youth as well. I am not fond of paintball, and have never “played’ myself. I agree with those who decry the “violence factor” here. There was an indoor paintball place in the next town, but the building was razed to make way for a drug store a few years back. I haven’t seen paintball ads much around here in recent years. That said, about 5 years ago, someone shot our house with a couple of paintball pellets, and I still can’t get the “goo’ (wax?) off the aluminum siding or out from cracks of the storm door it lodged into. (This happened in the dead of winter, with temps below zero, so it froze onto the siding.) Does anyone (you, Erik?) have any tips on removal? It’s collected dirt and looks like a giant dirt smudge on the front of the house. I’d rather the Amish teens (and English, as well) would choose sports over lobbing tomatoes or shooting paintball pellets at passing vehicles. Don’t they realize how dangerous it could be (and not only from a shotgun-wielding victim)? It confounds me. I really have no idea, Alice–perhaps some kind of paint thinner/remover? I’m not sure if it’s actual paint inside the pellets or some other substance. Either I need to google Paintball, or could someone tell me what it is? Just going by the name, I imagined it to be balls of paint thrown at a wall. Erik, thanks for the Amish Topics button along the top menu. I wondered what had happened to the “hot topics” button. Would you mind explaining the difference between the Amish Online Encyclopedia and Amish Topics? Have you been playing (or working?) with this website? Linda in paintball you use guns that fire small balls filled with paint, and try to hit the members of the other team. You have to wear fairly tough clothing and a protective mask as they go at a rather high velocity. On the Amish topics, I was going to mention that in a post…we got a request a little while back about doing something more forum-like to keep past discussion posts more visible. In lieu of an actual forum, for the meantime at least, I put together some of the more discussion-generating posts into a number of categories. So that’s what the Amish Topics covers, have just been testing it out to see how it is received. It links mainly to past daily posts that might otherwise get “buried” as time goes by. The encyclopedia pieces never appeared as posts, but are general-info pieces written specifically for that AOE section. Ouch! Sorry, I’ll pass on the paintball game. Thank you so much, Erik, for taking the time to explain about paintball and Amish Topics. This site just keeps getting better and more interesting! Thanks Linda, I hope so! 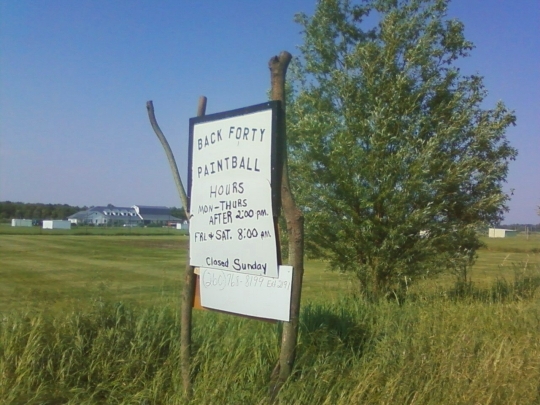 I was amazed that there is an Amish owned and operating paint ball facility. I do think if kids are going to do paintball, better it be at a facility and not at passing cars or houses. My son did go to a paintball birthday party last year and he loved it. I don’t have good or bad feelings toward it…and I much rather my son play paintball than the shooting video games. They can become obsessive and I really feel affect their concentration levels. After he would play video games, we would find he did not perform as well on the ball field. Thankfully, he is so busy with school and sports the game system is now never used. And with paintball, I think while it is shooting, it is looked at by them as strategy and harmless competition. I know after the bday party, the boys were impressed that they got someone from such and such distance, etc..kind of how they are all competing to hit a homerun now. Annmarie sounds like a reasonable take on it. I can understand how the violence and guns aspect might turn some people off. But how many kids play contact sports like football or hockey, which as we are seeing now can have serious long-term consequences on the brain. Good for your son for putting down the game controller and getting outside. I love the photo of the hand-lettered sign, complete with the words “Closed Sunday” which tips us off that it is an Amish owned business. Interesting juxtaposition there. Like you Erik, I tried paintball once and didn’t like it, though I understand its attraction. think of it? Is it allowed in some districts and not others? it might be mainly used by the Wellspring store and other stores. to see if my information is correct. I can’t imagine the church allowing any activity that resembled war or that you were required to shoot someone, especially with such real-looking weapons. I know the amish that I generaly do business with,near Marion, Kentucky, won’t even target shoot at a man silhouette. I don’t believe As long as I’ve been coming to this site that I’ve ever seen any pictures from there. If you’d like Eric, I’ll see if I can take some and send them to you for use here on your site. David thanks for the comments and the offer, feel free to send some along if you get the chance. The media image of “Rumspringa” is overblown but I think youth do a number of things that elders and baptized members wouldn’t approve of. Leave a reply to Amish paintball?